Will long-term care insurance cover NEHHC’s homecare services? Most times, yes. While early long-term care policies were often sparse in their coverage, newer or upgraded policies often cover our services. Our office will be happy to contact your insurance provider, with your permission, to determine the extent of your coverage. Who decides what services will be provided? Each client will have a written Plan of Care, formulated by all “key players” in the client’s life, including adult children, physician, and NEHHC’s supervising RN. Together, you will determine a specific plan of care that provides all the services and assistance you or your loved one need. The RN will make contact in person and via telephone on a regular basis, ensuring the ongoing quality of care, coordinating additional services, and serving as a problem-solver when needed. What specifically will our NEHHC caregiver do to help me or my loved one? What if there is a medical emergency? Are your home caregivers trained medical personnel? Yes. Most of our home healthcare staff are CNAs (Certified Nursing Assistants) with at least 150 hours of medical training. A smaller percentage are PCA/PSSs (Personal Care Assistants/Personal Support Specialists) with 40 plus hours of training. All staff are CPR-certified. Unlike many home health care providers, New England Home Health Care is state licensed, requiring us to adhere to rigorous staffing and safety standards. NEHHC also has 24-hour on-call services for staff relief and RN consultations. What if our NEHHC caregiver wants to take a vacation? Do I have to find a replacement? Absolutely not! Your caregiver is an employee of New England Home Health Care; we handle every aspect of care delivery for you, including scheduling replacement caregivers when needed. What if I or my loved one wants a different caregiver? Can we try someone else? Certainly. New England Home Health Care ensures that each professional we provide will have the proper level of training for his or her assignment. However, “personal chemistry” is also just as important a factor, and sometimes it takes time to determine. While we take steps to make the right fit from the beginning, we are dedicated to your or loved one’s satisfaction and will assign a new caregiver to you if needed. What exactly does “private pay” mean? Do you accept Medicare? Private pay means that the cost of NEHHC services are paid by the client, his or her family, or through private insurance, such as a long term health care policy. We do not accept Medicare. While Medicare covers a varied amount of skilled services, your personal care needs will often exceed what Medicare covers. NEHHC often works along with a Medicare Home Health Agency in order to give the client maximum home care support. Our company is dedicated, in part, to providing the many in-home services that Medicare does not cover, yet many families desperately need. While these services are not inexpensive, they are often critical to our clients’ quality of life, and to their family’s peace of mind. We strive to make them as affordable as possible. My parent is terminally ill and wishes to die at home. Do you provide terminal care or hospice services? NEHHC often provides for the needs of the last stages of life for terminally ill clients. It is a difficult, often bittersweet, period of life, and we do our utmost to make this time as comfortable as possible for both the client and family. While often interchanged for end-of-life care, the term “hospice” actually refers to a philosophy of providing the least amount of technology necessary to terminally ill clients and neither hastening nor extending life. 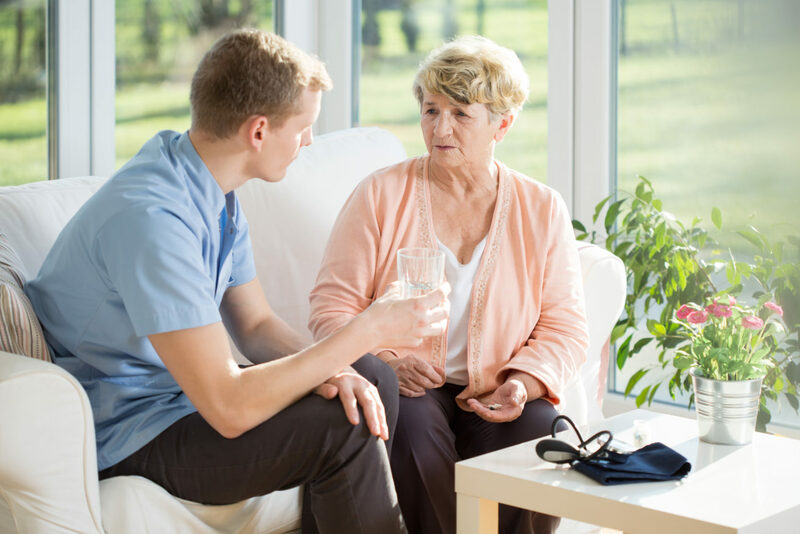 New England Home Health Care does not adhere to a particular philosophy about end of life issues, other than providing excellent, professional in-home care according to the client’s and family’s wishes. Is it true that NEHHC employees can’t accept “bonuses” or gifts? Yes, that’s correct. New England Home Health Care caregivers and support staff are unable to accept gifts of any kind from our clients or their families. It’s important that clients and families always remember that their caregivers are employees of New England Home Health Care, and as such are bound by their professional ethics to refrain from accepting gifts, money, or other items with any monetary value. However, smiles and words of thanks are truly welcomed and cherished! I would love to have New England Home Health Care provide homecare for my parent. However, I’m not sure our family can afford it. Are there any programs out there to help? Private homecare services are time and labor intensive, and are, unfortunately, not something everyone can afford. While there is no magic answer for those with a limited budget, our staff has seen many ingenious ways families have used creative financing to fund home care. The best place to start is by calling our intake specialist at (207) 945 3374 (toll-free: 1-800-287-0338) for a confidential, obligation-free consultation.